Better Speech and Hearing, and New Resources! The next OSEP Virtual Symposium will be held on Monday, June 18, 2018. This will be a live webcast, held 1:30–3:30 p.m. EDT. A recording of the symposium will also be available once the live event has concluded. The topic of this symposium is supporting high-quality special education services to children with disabilities by addressing the capacity needs of educators, IEP (individualized education program) teams, and administrators to develop and implement quality IEPs. Registration information and additional details will be added to the Symposia Series website very soon! This month, we celebrated Better Hearing and Speech Month (BHSM)! Check out our Twitter account for BHSM resources and information related to this year's theme, "Communication for All." I also want to highlight a fantastic webinar series featuring some of our OSEP grantees. It's available now on the National Center for Hearing Assessment and Management (NCHAM) website. NCHAM is funded in part by our partners at the U.S. Department of Health and Human Services. Additionally, I must mention the great opportunity I had this month to join many of my colleagues at the 2018 National Early Childhood Inclusion Institute. The event was held May 8–10 in Chapel Hill, North Carolina. It was such a pleasure to engage with the passionate and innovative attendees at this annual conference. Check out the conference website for more information on the presentations, speakers, topics discussed, and more. Thanks for Tuning in ... for Five Years! This month, we're celebrating our anniversary — OSEP has been publishing the OSEP Update newsletter for five years! We've made some big changes over the years (check out our archive to see how far we've come), and we've appreciated the consistent feedback we've gotten from you, our loyal audience. Now, we want to hear even more! We're looking for new ideas to better suit your needs. Send us your thoughts on the look and content of the newsletter, especially on the types of resources we're sharing. 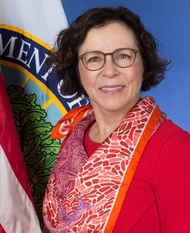 You can send ideas and requests for technical assistance (TA) opportunities, parent and family resources, information about U.S. Department of Education (ED) activities and initiatives, webinars, and more to Charlotte Stein at charlotte.stein@ed.gov. 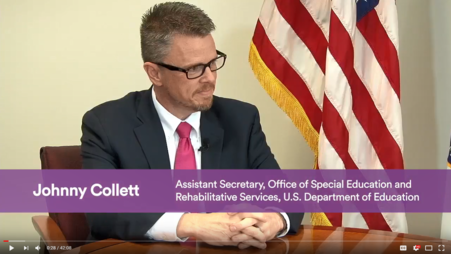 Assistant Secretary Collett Discusses Special Education and Endrew F.
Last month, Office of Special Education and Rehabilitative Services (OSERS) Assistant Secretary Johnny Collett participated in an interview to discuss the March 2017 Supreme Court decision in Endrew F. v. Douglas County School District, teacher professional development related to special education, federal regulatory reform efforts, and more. Now that the clarification period for SPP/APRs has ended, the final review phase has begun. This next phase will culminate in the release of letters to states regarding annual determinations in late June 2018. Earlier this month, states submitted their Individuals with Disabilities Education Act (IDEA) Part C grant applications. OSEP has now begun its review process of these applications. IDEA Part B applications were submitted later in the month. 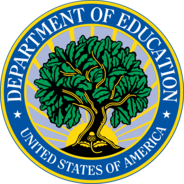 OSEP state leads are available to assist states regarding issues identified in the applications that will need to be addressed in order to make a state’s federal fiscal year (FFY) 2018 grant funds available for obligation on July 1. States also recently submitted their Phase III, Year 2 SSIPs. These are currently under review, and from late July to August 2018, state leads will be available upon request to discuss the feedback provided in these reviews. OSEP's May call for states focused on the SSIP and featured a presentation from Massachusetts’ IDEA Part C and preschool coordinators. The presentation highlighted the collaboration that occurs across the state's two coordinator systems, and included successes, challenges, and goals for continued progress. During the call, OSEP also led a discussion on the sustainability of state SSIP work, and announced its new early childhood-focused National Center for Pyramid Model Innovation (NCPMI). View 'Early Childhood Check-in' below for information about their recent website redesign. Based on recommendations from an internal assessment of the DMS process, and feedback received from states, OSEP is taking steps to refine and improve all aspects of the process for FFY 2018. Stay tuned for details. The IDEA Data Center (IDC) recently published a public reporting engine for IDEA Part B datasets and IDEA Part C datasets that display state-reported data for each of the 12 IDEA Section 618 data collections. They include the required disaggregations, such as race or ethnicity, gender, and age, and provide a more dynamic way for states to meet the 618 public reporting requirements. 2015–16 Civil Rights Data Collection (CRDC): Recently released by ED's Office for Civil Rights, the 2015–16 CRDC report highlights several new categories of data, including on Science, Technology, Engineering and Mathematics (STEM) course taking. See how students with disabilities are doing in the latest CRDC data briefs: STEM Course Taking and School Climate and Safety. 2017 State of Preschool Report Available Now! The State of Preschool 2017 is the 15th edition of the National Institute for Early Education Research’s (NIEER's) annual "yearbook," a report that tracks state-funded preschool access, resources, and quality. Nationwide in 2017, state-funded preschool program enrollment exceeded 1.5 million children — 33 percent of 4-year-olds and 5 percent of 3-year-olds. This year’s report includes a special section on policies affecting dual language learners, and also highlights changes since 2002, when NIEER first began tracking state pre-K. In addition to a national overview, the report provides a profile of each state’s preschool program. A searchable resource library for fact sheets, issue briefs, webinars, and more. Opportunities to share your examples of program-wide and statewide implementation. Upload to the Community Contributions and Pyramid States pages and take part in the Pyramid Nation community! Links to the #PyramidModel social media conversation: we've compiled a social media stream across many platforms — check it out! May 10: Letter to Zirkel addresses how a school district may meet the IDEA requirements related to documenting assessment of student achievement and progress (34 CFR §300.309(b)(2)) when the district uses a severe discrepancy model for determining whether a child has a specific learning disability under IDEA. Check out more of our resource documents and letters on the new IDEA website. Literacy Resources for Families: What Is Phonemic Awareness? Visit the ED-funded National Center on Improving Literacy's (NCIL's) website for new, interactive resources geared towards parents and families of children with, or at risk for, literacy-related disabilities. We'd like to highlight NCIL's module on phonemic awareness (PA) that explains PA skills, their importance, how practitioners should be teaching them, and other critical information for families supporting their child's PA development. 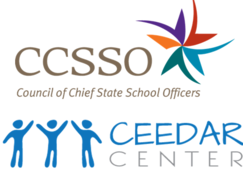 The National Collaborative on Inclusive Principal Leadership (NCIPL), with support from the Council of Chief State School Officers (CCSSO) and OSEP's Collaboration for Effective Educator Development, Accountability and Reform Center (CEEDAR), has released a new online resource, Supporting Inclusive Schools for the Success of Each Child: A Guide for States on Principal Leadership. The guide offers state leaders eight key strategies for developing and supporting principals to lead inclusive schools where each student excels and feels safe, supported, and valued. Its focus on equity is particularly important for the success of students with disabilities. Advancing policies that support inclusive principals will pave the way to improving instruction and creating positive school climates for the success of each child. the importance of improving the collection and sharing of data to inform future research efforts and the development of evidence-based practices. Please save the date for the ED Office of State Support-hosted 2018 Combined Federal Programs Meeting, to be held on Dec. 6–7, 2018, in Washington, D.C. State directors and staff who administer ESSA Title I, Part A; ESSA Title II, Part A; ESSA Title III, Part A; state assessment grants; IDEA; and foster care and related federal programs are invited to participate in the meeting. The conference will provide an opportunity for attendees to network with other states, ED staff, TA partners, and other subject matter experts around the implementation of ESSA consolidated state plans. Attendees will have the opportunity to share resources with one another, work collaboratively through common problems of practice, and preview new tools from our partners and other states. Each state is encouraged to build a team of attendees that meets its specific needs. More details will be provided once the agenda is finalized. This month, in honor of BHSM, we interviewed Will Eiserman. Eiserman is the director of NCHAM's Early Childhood Hearing Outreach (ECHO) Initiative. In the interview, Eiserman shares key takeaways from his ECHO work, including the importance of conducting regular hearing screenings on young children. He also highlights resources available for communities and programs to expand hearing screenings. 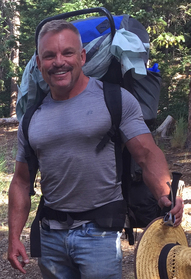 Check out the full interview, among other BHSM-related posts, on the OSERS Blog.